I've backed both of them. I'm buying two of the Wyrmwood carriers-- one's going to be engraved "His" and the other "Hers". I can't wait! I also invested in the Super Dungeon Explore: Legends even though I haven't yet received the most recent Kickstarter "Ninja All Stars" which is projected to ship in 2 months in December. No one can have too many chibis, right? (But don't get me started on the Scale 75 Smog Riders!) 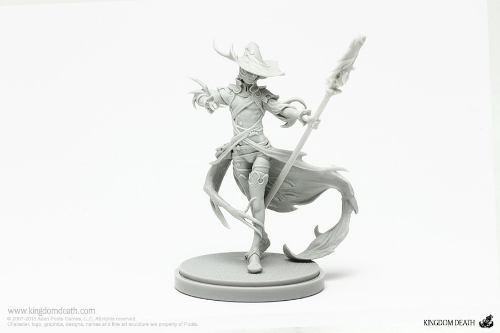 If that wasn't enough, I received an e-mail newsletter from Kingdom Death this weekend. Oh boy. I'm never allowed to get sick again. It's too expensive. Luckily, on Monday, I was feeling well enough to do some work on the next miniature I'll be finishing, Carla McCarthy. While I've been working on her bit by bit, she's taken a back seat to a few competition miniatures I've worked on but no more procrastinating!